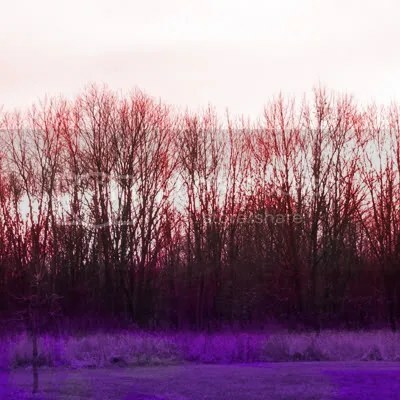 Of Nature Real and Manipulated – Let's Paint Nature! You see thankfully nature is not just sight. It is smelling moisture in the air before a storm, it is hearing the wind rush through tree branches in the distant as it quickly gets closer, it is the touch of slippery algae covered rocks in the pond, and the taste of wild chives growing in spring. I don’t know why I worry so much but I do and I need not to. Thank you God. What would become of my art should such a fate befall? Limited but not destroyed. My friend and co-member of the LaGrange Art League, Lloyd Bradbury has overcome this limited vision obstacle. He did not let such a problem paralyze his creativity but continued on. He gives me great encouragement. This picture I took has been touched up on the computer. Not because it wasn’t beautiful on it’s own, but just for the fun of it. The picture seems to exaggerate the bare twigs against the sky, one of my favorite winter features. This picture I took yesterday is real. 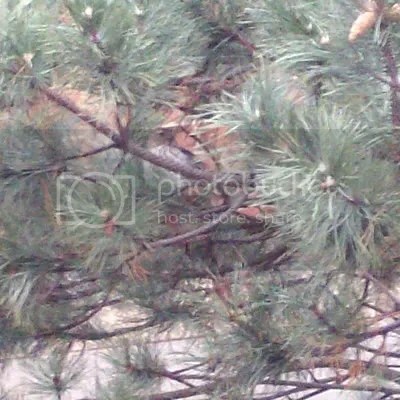 Can you find the hawk hiding in pine camouflage? I saw him fly at great speed and land right in the middle of the pine. All of us in our own way can enjoy what was made for us. I will never take that for granted. Nature-based art seems to me to be taking in through whatever senses you have the beauty around you, interpreting it within yourself, then communicating the results outward to share with the world. Good for Lloyd Bradbury for continuing on. As for photographic manipulation vs. straight-from-the-camera “real” photographic images, to me each one is a flavor and a preference, like chocolate or vanilla. Both have their place. What are you in the mood for today? In the top forest picture, I like the diagonally-sweeping stripe of light climbing through the trees. In the bottom evergreen, I like the regal aspect in the hawk’s pose. Just want to say how much I am enjoying your blog. I especially like it when you take us through the steps of building your paintings. I also like the God-the-creator theme. Country Dreaming: Very well said! I like chocolate and vanilla 🙂 It is so much fun to read the individual translations of people relating to nature. Northern Birder: Thank you so much! And thank you for taking the time to comment, it means a great deal to me. I’m so very thankful that I was given the blessing of artistic ablility and have the opportunity to share it too! Nature is a gift for the entire human being, for the very core of who & what we are, a feast for the soul, if you will.